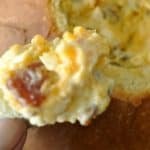 This recipe for Hot Bacon and Cheese Spread can be made in a loaf of round bread OR in a small gratin dish and served with crackers. Either way, it makes a spectacular party dish to share with friends. Bubbling hot cheesy bacon dip, yes please! There is something to be said for well-stocked pantries; they rarely let you down when you need them the most. Just last week I was saved by mine. It was Thursday, an ice day here in Alaska, a day deemed to dangerous to be out and about for school, so we were house bound. My dilemma was this; I needed to prepare TWO dishes for TWO separate occasions the next day. I didn’t have a worry in the world though because I KNEW I could count on our stores to pull us through, and I wasn’t disappointed. I managed to make cookies with kids, make a delicious coffee cake and pull off the Hot Bacon and Cheese Dip for my husband’s monthly potluck without having to run to the store. I had to make a few substitutions to the recipes I wanted to use but they turned out so well that I like them better than the original. Always good to have a recipe like this in your "go to" file.